One of the charms of Romero Britto’s vibrant artwork is its representation of his pride for where he lives. Britto’s artwork shows shades of using bright colors to express himself; he learned the importance of expression and city pride from Francisco Brennand, the local muralist he idolized growing up, according to a post from T Brand Studio of the New York Times. Britto’s work has continued to represent the vibe and aesthetic of Miami, another vibrant city that has a large Hispanic population. “Miami reminds me of Recife because of the water,” said Britto in an interview with the Miami Children’s Museum. Britto has lived in Miami for almost 30 years and has become engrained in the local culture. 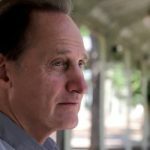 His works have become so synonymous with Miami that he was commissioned to do a plethora of art and several sculptures around the city. 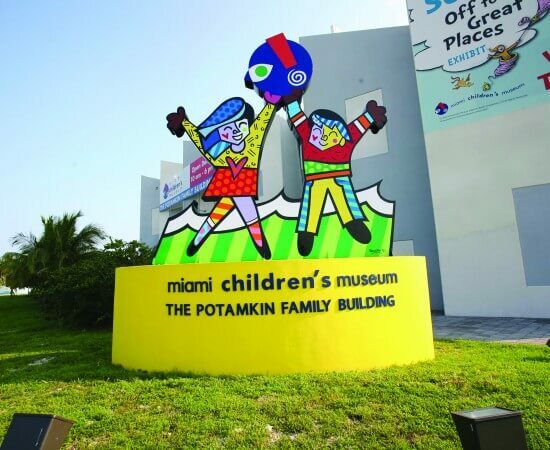 The first work that Britto was commissioned to create in Miami was a sculpture outside the Miami Children’s Museum. He completed the sculpture in 2003 – it’s called “Miami Kids” – and it still sits in front of the museum today. The Britto sculpture at the Miami Children’s Museum. (Photo courtesy of romerobrittohum2020). Britto was commissioned to create a sculpture atop the Pinnacle Building apartment in Miami’s art-heavy Wynwood district in 2007. It was entitled “Love Blossom” and took over 20 bolts to secure the large sculpture atop the building. In 2008, Britto was commissioned to paint the walking ramps at Sun Life Stadium, home of the Miami Dolphins. Despite being painted over during a 2015 stadium redesign, his art at the stadium became a staple for Dolphins fans attending games. Perhaps the most recognizable sculpture Britto was commissioned to do, though, is on the corner of Fifth Street and Alton Road in Miami Beach – in front of a mall named after the crossroads. Designed in his signature pop art style, the structure is named “North Star” and depicts a beach ball and two overlapping palm trees. The work has become symbolic of the Miami arts scene. 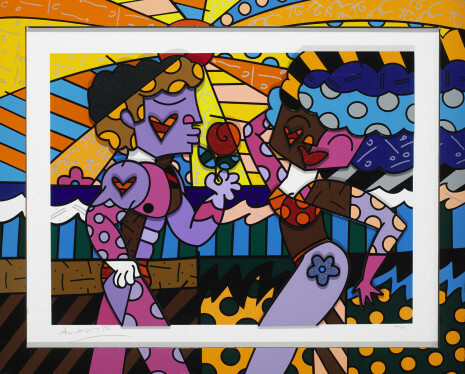 “South Beach Couple” by Romero Britto. There is nothing that cements Britto’s place in Miami art culture like his art studio located in Miami’s Wynwood neighborhood. The budding new area is known for its eye-popping street art scene, which fits into Britto’s aesthetic perfectly. Just like many other buildings in the neighborhood, Britto has painted the outside himself. He often collaborates with groups and organizations to create new murals on the exterior of his studio, such as the contestants of the Miss Universe pageant in 2015. According to his website, the mission of Britto Central stays true to the mission of Britto himself, which is to make his art accessible to everyone and invoke happiness. 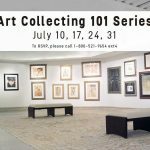 Park West Gallery shares this mission of wanting art to be for everyone. Fans of Britto’s colorful style can collect his three-dimensional relief graphic works.